Isambard Kingdom Brunel was a dynamic bit of a man with a high beaver hat full of memorandums scribbled to himself, and a leather pocket case holding fifty Trincomalee cigars. The jut of a cigar from his olive-complexioned face was a famous sight of the time. He was the most celebrated civil engineer of the middle nineteenth century. . . . The Little Giant built railroads, bridges, dry docks and steamships amidst salvos of controversy. He was possessed with grandeur. Everything he did was outsize, brilliant and radical. He built the Great Western Railway from London to Bristol with tracks seven feet wide and a two-mile tunnel near Bath which had conservative peers rising in the House of Lords with cries of doom. (The tunnel is still holding). The Clifton suspension bridge at Bristol, now 125 years old, is another Brunel audacity. It is a single 702-foot span, 248 feet above the River Avon. It was made of cast iron. Compared with the Brooklyn Bridge and allowing for the superior steel cable the Roeblings used in New York and the larger fund of experience they inherited fifty years later, Brunel's bridge is rightfully one of the world's wonders. 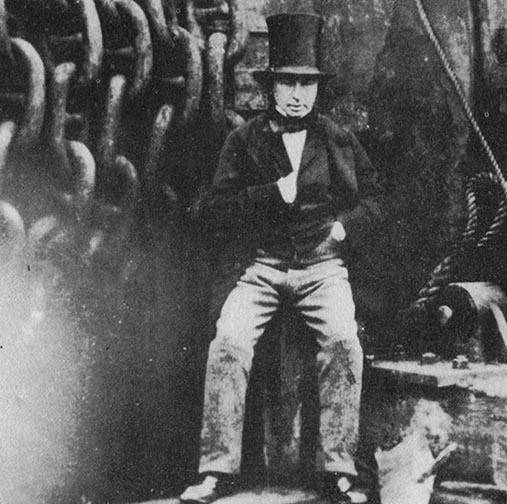 Isambard Brunel's first skein across the chasm was a castiron bar an inch and a half thick. To encourage his workmen, the Little Giant elected to make the first crossing with himself and his wife in the basket car. Halfway across, the car stuck. He removed his high beaver hat and climbed the suspension chains to the swaying bar, freed the jammed pulley and proceeded with his lady to the other pier. The Little Giant built twenty-five railroads in England, Ireland, Italy and India, and the precipitous Taff Vale line in Wales, a choice collector's item among contemporary rail fans. He built eight piers and dry docks, five suspension bridges, and 125 railway bridges. He invented the compartinented freight car, an innovation reinnovated a century later by U.S. railroads. He introduced railway telegraphy in 1839. In 1825 he published an argument for a canal through the Isthmus of Panama. During the Crimean War he designed an armored gunboat, which would launch amphibious tanks to attack the Russian forts at Cronstadt. The vehicles were to be powered by jet propulsion. The idea was ninety years too sudden for the Admiralty. The War Office, however, carried out another Brunel design, a 1,500 bed military hospital, prefabricated in England (no part was too heavy for two men to carry) and erected at Renkioi, Turkey, by twenty men in seven months. The hospital had excellent plumbing, and pumped twenty-five cubic feet of cooled humidified air per minute around each bed. While he was building the Great Eastern, Brunel was also managing the big railway hotel at Paddington Station, "a very agreeable relaxation from his more important duties," said his son.